Candy canes first came to America in the 20th century. When they first were made they were not canes at all, but rather sticks and they didn't even have stripes back then. Candy canes were one of the first Christmas candies available and were just peppermint flavor. When it comes to candy canes times have change. Although the traditional flavor of candy canes is still peppermint, they are now available in just about any flavor you want. One of our most popular flavors are Sweet Tart Candy Canes. They have a sweet and tangy flavor in each cane. The bold colors makes kids just want to eat them right away. The 3 flavors of these canes are: Green Apple, Cherry, and Blue Punch. For those who love the sour taste of sour patch kids there is a candy cane for them too. Just like the sour kids these candy canes have a sweet sugar coating before the sour blast. The canes are red, green, orange and yellow all with white stripes. Flavors are Radberry, Lime, Orange and Yellow. Jolly Rancher Candy Canes are another one of our top sellers. Everyone has loved the bold flavors of jolly ranchers for years. Now you can have your favorite fruity flavors in the shape of a cane. You get strawberry, mixed berry and watermelon flavors in this box of canes. Of course we have the classic red and white peppermint candy for those who like to stick to the traditional old time Christmas Candy. Each candy cane as a cool minty flavor that is loved by kids and adults. No matter which flavor of cane you prefer one thing is for certain. Christmas just isn't Christmas without finding a candy cane or two in your stocking. 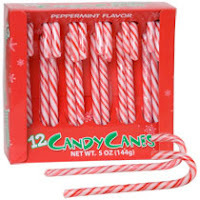 We have many other flavors available, check out all our different Candy Canes available this Christmas.